My kitties were months ago saved from the peril of living in a wienie shack by my hubs and I. Since then they have only known us as Mommy and Daddy, but when I’m playing around on the computer and checking up on the blog-o-sphere, I often find myself covered in kitty! Because they just loooooove to see Ashley‘s baby Kitty Paw! 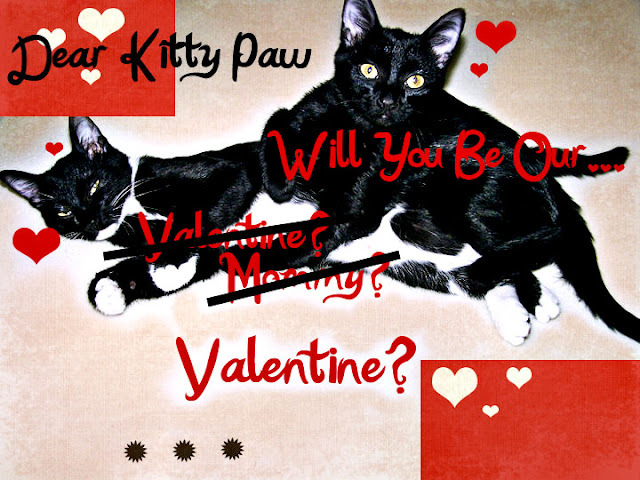 And since Kitty Paw is looking for some Valentine love, Spaz and Fizzle just had to make a card for her. Oh Kitty Paw, won’t you be their Mommy Valentine? 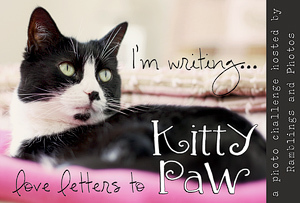 See more love letters to Kitty Paw! 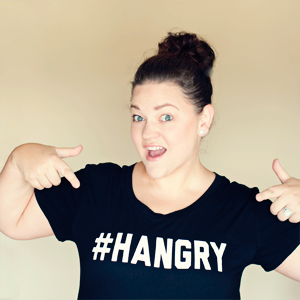 Kitty Paw has enjoyed the single life but she'd definitely hang with your kitties. They are so cute -- what adorable faces!